This job works to keep the parish facility up and running in good order. Help with our church facility located in a garden helpers are needed for a few hours a month to do some clipping, weeding and more to enhance the beauty of God’s creation. 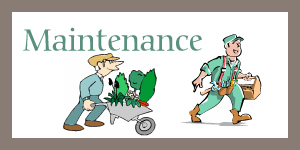 General cleaning, upkeep, and maintenance of the parish hall kitchen and bathrooms. Other responsibilities include the setup and take down of tables and chairs. A dedicated group of individuals assessing and recommending upkeep and repairs to the parish.